Ronimo Games Forum • View topic - Some small suggestions I have for Awesomenauts. Some small suggestions I have for Awesomenauts. Post subject: Some small suggestions I have for Awesomenauts. Heres a couple ideas I had for awesomenauts that I wanted to share to see what you think. 1. Allow bots to spawn in brawls, especially deathmatchs. Even if they stand and do nothing, its better then a match being a 1v1 where someone leaves, leaving the other player unable to win or lose. 2. Rename Unlimited Power to Shopping Spree. It's not really that the nauts have unlimited power as it is the shop having everything on sale. 3. Random Droppod and Skin option, to go with the existing random announcer option. 4. Lore section during streamisho, where watchers can ask questions about the lore or submit ideas, which could be accepted into canon by the team. 5. Kill quest to be changed to count Kills and Assists, with the amount needed increased if necessary. 6. a level 3 gold/fancy droppod for the regular droppod line, which is gettable from special droppod parts, which you could get 1 from getting a character to max level. perhaps not too many though, so if players are good with some of the characters, they can get the parts from others. 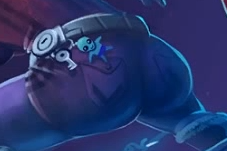 would be a nice status thing and a good reason to level your favorite nauts. Post subject: Re: Some small suggestions I have for Awesomenauts. I wonder why the random skins arent in yet? I remember the time when *I* suggested the Random Announcer feature to be added, and in 2 weeks Robin ( I think) was cool and answered me they added it due to my request. I have always kept that turned on ever since. I guess its just the lack of motivationdue not being successful in ways wanted etc. compared to then. Random skins used to be a thing but was removed for no reason. Granted it was random skin for whatever character you randomed but still. They disappeared when Ronimo untied the game from steam servers.